We just made it back to the Alps for New Year’s. It’s so great to be back. The air is crisp and the sky is so clear up here. This beautiful ski village is called Sestriere, located up in the Milky Way mountain range of the Alps in Piedmont. Last year we ate our way through the town. I was addicted to polenta and gofris! On New Years Eve, however, we made dinner at home to ensure that we enjoyed the proper Italian ‘good luck’ dish to start the New Year off right. This Italian dish is called cotechino con lenticchie (sausage with lentils), which consists of one ingredient that I love and another that I hate. I guess you can say I like to start my year off with a perfect balance of yin and yang. Eating a piece of sausage before midnight will bring good luck for the new year and lentils are said to bring money, so stalk up! Below is a recipe that can feed up to 6, or in my household just 2. What New Year’s tradition(s) do you have? 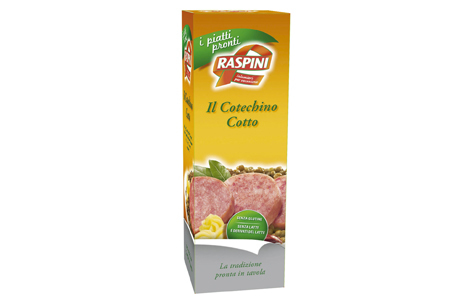 I’ve heard Spaniards cram 12 grapes into their mouths, which sounds just as hard as eating cotechino. You can’t go wrong with lentils. I grew up on them. My favorite was lentils with cut up hotdogs, remember that? I digress. This type of sausage is the greasiest, heaviest kind I’ve ever had. It’s a mixture of nasty ingredients that one should never eat: pork rind, pork meat, pork fat, oh and spices. I’ve only tried it encased like a typical sausage, but it’s also served inside the casing of a pig’s foot, fancy, huh?! Usually for an hour, unless you’re using canned lentils. If it’s uncooked, place sausage in a large pot with cold water and bring to a boil. Reduce to a low boil and cook for 2.5hrs. If it’s precooked, boil it for 30-40min in the lovely bag that it comes in. Cut them up and cook them down slowly with a teaspoon of oil until the fat starts to melt, about 15min. The melted fat will add flavor to the lentils rather than just adding olive oil to the whole dish at the end. Plus, this dish does not need any added salt since the bacon in the lentils does all the work! Add the chopped onions to the bacon and soften them for about 5 minutes. Add the bay leaf, if you have one. Pour hot water to cover the lentils and let the bacon, onion and lentils cook for 30-40min. Add liquid from the cotechino to keep the lentils covered. If you are using canned lentils, then cook the onion for and additional 15min with a bay leaf and the bacon, then add the canned lentils for 5-10min. Strain the excess water from the lentils, if any, and plate it. 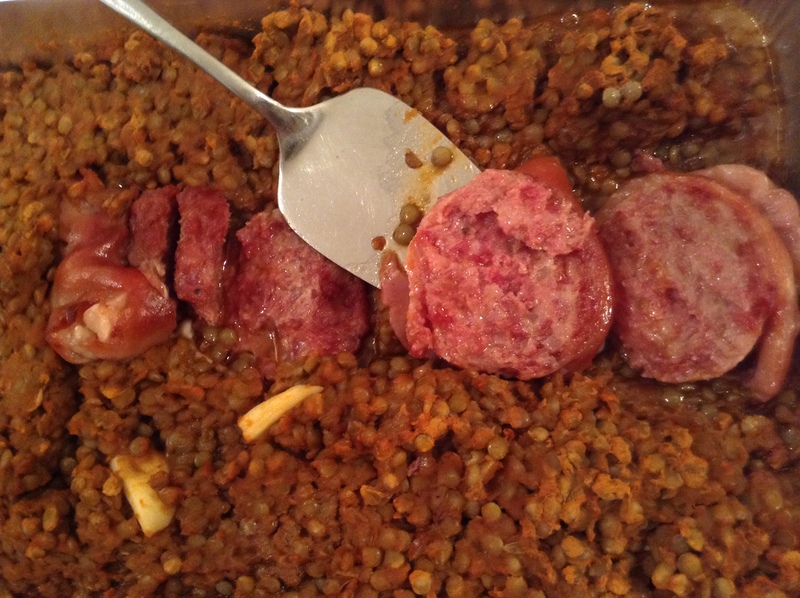 Remove the cotechino from the pot, slice it and place it on top or along side of the lentils. I used to eat this all the time when I was younger! Thanks for the recipe so I can try to make it alone now! Really!? 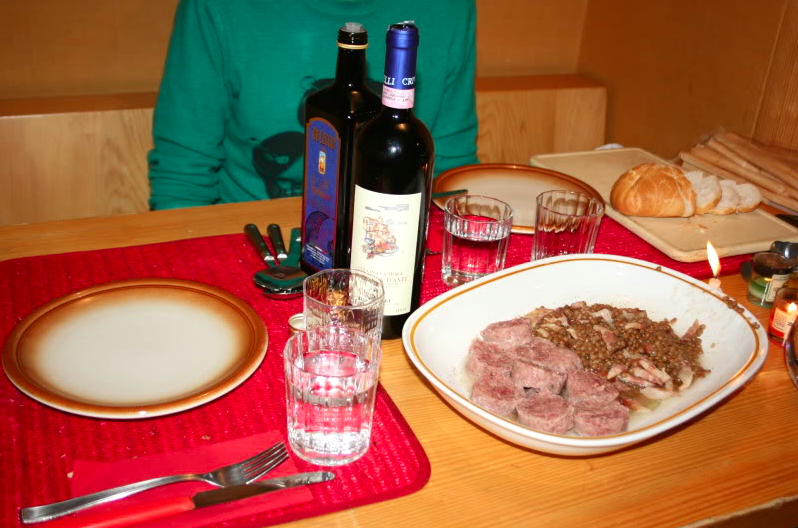 I never heard of cotechino until two days before New Years last year. Tomorrow I will serve a double portion of lentils and a quarter of a slice of cotechino for just enough good luck. Enjoy it and Happy New Year! Hay dios mio. Looks like SPAM!!!! Is there a Heart Surgeon near by?? Exactly! Pretty heavy duty! I will have a bite of it tomorrow night and Nicco will polish the rest off!